Q: When is a Coke can an elephant (or possibly a giraffe)? A: When Farai’s had his creative way with it! Farai is a member of the Mother City Craft Collective, a collective of traffic-light crafters who you can see selling their wares as you drive through the streets of Cape Town. This group of Zimbabwean crafters have joined forces to expand their market and create an alternative outlet for their crafts, an online shop. This has brought a new set of challenges for these artists, because the traditional wire & bead and wirework crafts that they produce are pretty heavy, which results in very high postage costs. To reduce the price of postage (and consequently the carbon footprint of the piece) Farai has come up with an interesting solution. 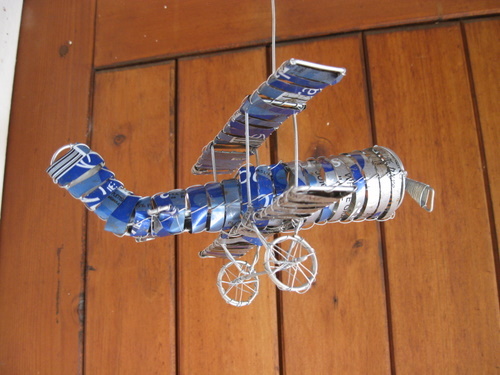 He’s using recycled materials that are a lot lighter than the materials that he usually works with. 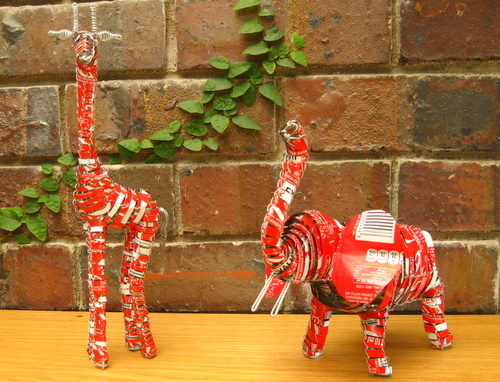 These recycled Coke can animals and more are available from the Mother City Craft Collective’s recycled range, and as you’ll see, both the cost of the products and the postage costs are considerably less than the traditional. While buying crafts from this store makes a huge difference in the lives of these traffic-light crafters, by choosing from the recycled range you will be making a huge difference to the environment too. So while necessity is the mother of invention, isn’t it great when it also leads to recycling, reusing and a greener way of doing things? I definitely aprove this toys ! I’m a recycling maniac, every single thing a have in my hands, I think how long would it take to degrade in environment… and also, think they are so cute ! I love these. Whimsical, fanciful, recyclable. Wow, love the coke elephant. We have so many creative green thinkers and inventors out there that are doing an amazing job inspiring others to go green. Cute ideas! We have a lot of “artsy” folks here in Santa Cruz California, so they will fit right in. So BEFORE you recycle – channel your inner Rodan! This is a great way to upcycle cans and turn them into something useful. There are lots of things that can be done with waste that nobody thinks of in their every day. Its all about taking the time and looking at waste in another way to design something interesting and sustainable. These toys are great! They look very well crafted and free up space in our landfills! What more could you ask for? Now THIS is an ingenious way to promote recycling! I like the fact that it also teaches the value of recycling to children (the recyclers of tomorrow!!). I is always refreshing to see something most people consider garbage put to good use. I was recently on a vacation in a resort, and they had this long path down to the beach and they used 1.5 liter Coke and Sprite bottles as the roof over the walkway.